It's the time of the year when gingerbread and peppermint everything is exploding all over the place. I kind of love it. I adore gingerbread and peppermint, and I only allow myself to indulge in these glorious flavors during the month of December. So, needless to say, I am diving in head first. 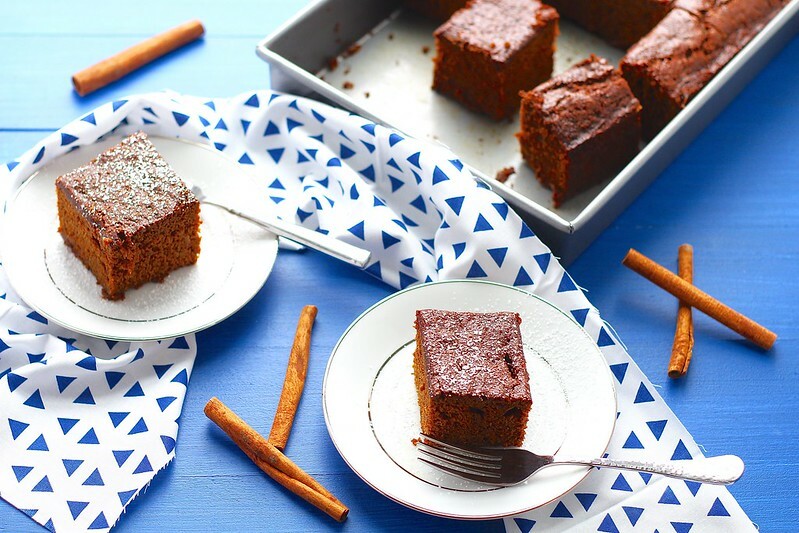 I have several gingerbread recipes to share with you in the upcoming week or two that I am pretty excited about. Now for peppermint recipe brainstorming.. On a different note, we had a white and very cold Thanksgiving, which in turn, made me really want to decorate for Christmas. Which never happens. I like to enjoy each holiday, one month at a time and I am strict about no Christmas music, foods, or decorations until December 1st. After that, all bets are off and Christmas mode is in full swing. But when it was cold outside, the fire was blazing and the snow was falling at a rapid rate, it made it difficult to resist dragging the Christmas things out of the attic. What do you do? By the looks of my Instagram feed, many people start decorating for Christmas in early November. Do you decorate early, or are you more like me, and wait for each holiday to come at the slower pace? 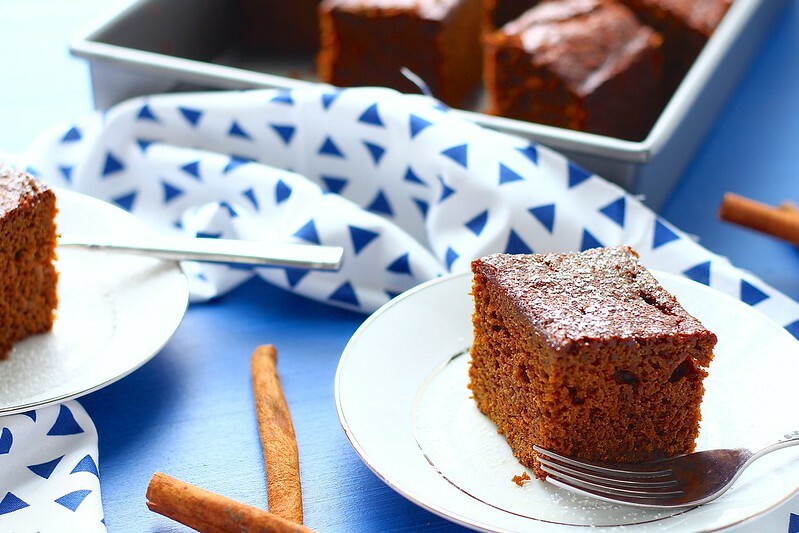 So a classic gingerbread cake is something that I have always loved, but never really made a lot of. For whatever reasons. A little while back, I had the craving for a simple gingerbread cake. So, I gave a scroll through my bookmarked recipes and came across the perfect one. Tall, moist and full of spices. Simple and straight forward- exactly what I was looking for. This is particularly moist, so it's ideal to consume within a few days. But it's so light and airy at the same time, that eating more than one piece isn't difficult. I served it with freshly whipped cream or a dusting of confectioners' sugar, and everyone in the house was incredibly pleased. Plus, this makes your house smell divine while baking. So, if you aren't in the Christmas spirit yet, or are already knee deep in it, stop a moment and get into the kitchen and bake up this cake. It's perfect for a mid afternoon snack, to pack in your lunch box, or to feed a crowd. Preheat the oven to 350ºF. Grease and flour a 9x13-inch metal baking pan*. Set aside. In the bowl of a stand mixer fitted with the paddle attachment, cream together the butter and sugar until light and fluffy. Beat in the eggs and molasses until completely combined. In a medium sized mixing bowl, whisk together the flour, baking soda, salt, cinnamon, ginger and cloves until combined. Pour into the butter mixture and mix until no flour streaks remain. Mix in the applesauce and water on low speed or by hand until completely combined. Pour the mixture into the prepared pan and place in the preheated oven. Bake for 40-50 minutes, or until springy to the touch and a toothpick inserted into the center comes out clean. Let cool completely before slicing and serving. Serve with whipped cream or a dusting of confectioners’ sugar. Store, well wrapped in the refrigerator up to 5 days. 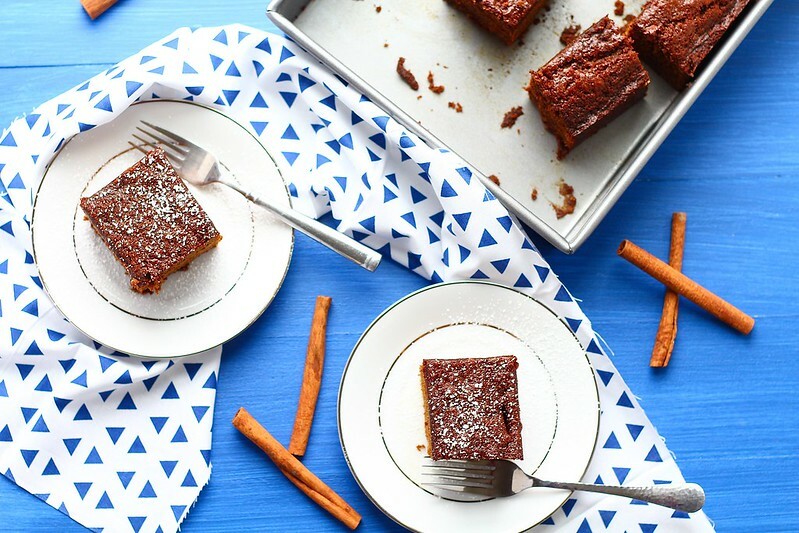 *You can cut this recipe in half, bake in a 9x9-inch pan if you don’t want all that cake. Keep the baking time the same.